Cut down your very own fresh-from-Florida Christmas tree in the Ocala National Forest. Join the Florida Wildflower Foundation on Dec. 8 for a fun, family-friendly day in the forest. Meet at the Pittman Visitor Center on US 19 in Altoona (across from the Lake Dorr Campground) where Forest Service biologist Jay Garcia will introduce us to the Ocala National Forest. Learn how the scrub habitat is being managed and restored. Find out why the Forest Service is allowing people to cut down trees and how it fits into their management plan. 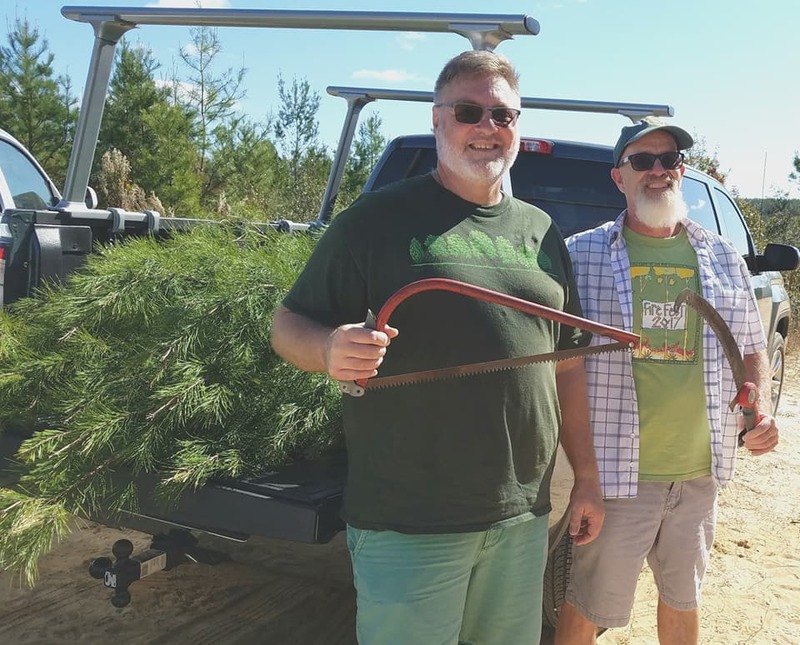 Then we’ll caravan to the Christmas tree cutting site, where everyone with a permit* will have the opportunity to pick out and cut down their very own fresh-from-Florida sand pine. We may even see some of the forest’s rare and endangered plants, and some forest critters, too. The weather should be mild, so stick around and enjoy a hike or picnic in the forest. FWF Members Jeff Weber and Chris McGarvey joined us in 2017. NOTE: The deadline for purchasing tickets and permits is 11 p.m. on December 1. NO REFUNDS — This is a rain or shine event. * A permit is required in order to cut down a tree. Permits are $7 per tree and can be purchased below along with your field trip ticket. Limit one permit per person. A maximum of 20 permits will be issued. Permit fees benefit the Ocala National Forest programs. ** Call 407-622-1606 or email RKinane@FlaWildflowers.org to find out if your membership is current or needs to be renewed. To join as a member, visit www.FlaWildflowers.org/support. Bring a hatchet and/or hand saw to cut your tree. You may also want bring loppers to trim stray branches. Bring ropes or bungees to secure the tree to your vehicle. Bring sun protection, drinking water, snacks and whatever else you need to stay healthy and comfortable in the scrub environment. Pack a lunch if you plan to stay and enjoy the forest. Wear weather- and environment-appropriate clothing. Long pants, a hat and closed-toe shoes are recommended. Bright colors are also recommended, as it is hunting season. The forest roads are sandy; vehicles will get dusty. The roads should be fairly solid but may be bumpy. A four-wheel drive vehicle is not necessary. This educational opportunity is made possible by the State Wildflower license plate. Get yours today!